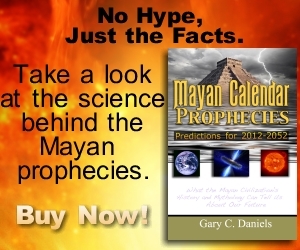 TheRealMayanProphecies.com » News » Russian meteor predicted by Mayan prophecies? 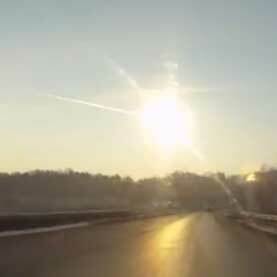 A Meteorite exploded above the town of Satka, near the city of Chelyabinsk in Russia. The meteor that exploded over southern Russia is just the opening act of a new age of disasters predicted by Mayan prophecies says the author of the book Mayan Calendar Prophecies. In fact, these “prophecies” were more like scientific forecasts based on the discovery of a repeating cycle of such cosmic catastrophes the author argues. The ancient Maya discovered such a cycle lasting over 5000 years between major impact events and encoded this knowledge into their calendar, the author says. Thus December 21, 2012 was not the end of the world but simply the end of this 5000-year cycle and the beginning of a new cycle of cosmic catastrophes. The last time the Mayan calendar ended, the author notes, Earth was devastated by a massive impact event. This impact occurred in the Earth’s oceans which led to massive mega-tsunamis that devastated the coastal civilizations of the time. This event resulted in flood myths such as the Biblical flood being recorded in ancient texts and oral traditions all over the globe. Yet this big event was preceded and followed by 200-300 years of smaller bombardments similar to the recent event in Russia. The author likens this scenario to flying through a hurricane. At first you experience light rains as you pass through the outer bands. Next your get moderate rains as you continue into the storm. Finally you reach the most severe rains as you pass through the center of the storm. Right now we are in the outer bands of this meteor storm. There has been an ever-increasing amount of eyewitness sitings of meteor fireballs over the past few years and now we’ve have our first airburst event. We should expect to see an increasing number of such events over the next few years and decades culminating in more severe and larger bombardments. According to the Mayan predictions the most severe events should occur between the years 2032-2052. Eerily, NASA is currently tracking several large asteroids that have a chance of slamming into Earth during this time period. But NASA is only tracking the large asteroids. Meteors like the one that exploded over Russia are not being tracked and thus no one knows how many are currently on a collision course with us which means they can strike us without warning at any time. “On December 22, 2012 there were a bunch of high-fives and back-slapping going on in the academic community as they celebrated the fact that the world didn’t end the day before. But their celebrations were a bit premature and based on a complete misunderstanding of the Mayan prophecies. The Maya never predicted the end of the world on December 21 but they did predict that we would experience greater catastrophes AFTER this time period,” the author notes. Thus it appears the Russian meteor is just the beginning and we should expect more such events in the years to come.